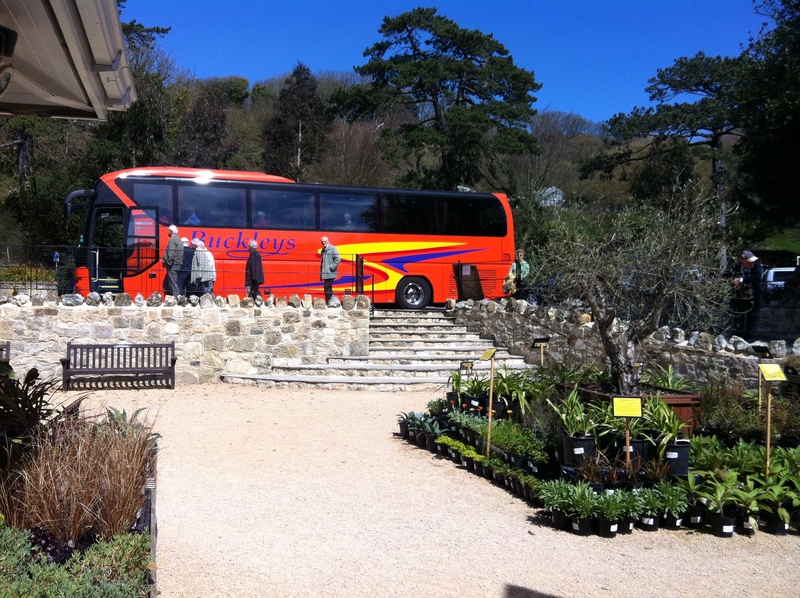 Ventnor Botanic Garden is an ideal coach party destination, with ample parking available for large vehicles. Come rain or shine, Ventnor Botanic Garden is a great place to visit. When the sun is shining visitors can walk the Gardens at their leisure and enjoy the colourful flowers in bloom. Visitors can sit out and soak up the sun whilst enjoying lunch, a refreshing drink or even an ice cream. In inclement weather, visitors can spend time looking at the regular displays and art exhibitions taking place in The Garden Gallery. They can warm up in either of our Café with a hot cup of tea or coffee, or they can step into The Temperate House. This hot and humid glass house is a living representation of nature’s fight back against the ravages of man and industry. Complete with waterfall and giant pond that grows Giant Waterlilies in the summer months, our Temperate House will transport visitors to a rain forest paradise on even the coldest of days. Ventnor is a very sunny town getting the most amount of sunshine hours in the UK. Where else can you stroll through Australia, the Mediterranean and South Africa – all in one day! From stunning scenery, wall lizards and guided tours of the garden, a secret tunnel, an underground mushroom fruiting chamber and the Victorian Heritage Centre exhibition to discovering Giant Amazonian Waterlilies, the Temperate House & Hub, art gallery, rare plants and seeds, garden produce and gifts in our garden gift shop and Botanic Ale and hopyard! With easy access from the Coach drop off point, The Plantation Room Café serves tea and coffee and delightful homemade cakes & light lunches throughout the year. Overlooking the beautifully serene and historic Palm Garden, The Plantation Room Café Terrace is the perfect place to sit out and enjoy the tranquility of the sub-tropical Garden whilst making the most of the Winter sun. Not to forget our popular cream teas! edulis Restaurant is set in a unique setting in the Mediterranean Garden, giving the feeling of dining ‘al fresco’ within the relaxed setting of our restaurant. Head Chef Brad Roe brings a wealth of experience, from around the world including a significant number of years as Executive Chef in the USA. The ethos of edulis, meaning edible in Latin, is to serve super fresh cuisine sourced locally and picked fresh from the Garden daily. Home-grown ingredients range from unique and interesting vegetables grown in our nursery beds, served alongside our exotic mushrooms, micro herbs and living-salads ensuring that our food is literally Garden fresh. Unique Garden-made products are now available in our Shop to treat your family and friends. Many are made from rare and exotic ingredients grown here at Ventnor Botanic Garden. COACH PRICES FOR 2019 (please note that booking is essential for discounted group fares). OR CALL US ON 01983 855397 or email info@botanic.co.uk. with the date(s) you plan to come and the anticipated size of your party. We can also keep you informed of special events happening at the Garden. There is usually art or craft exhibitions and also a variety of walks and talks scheduled throughout the year.